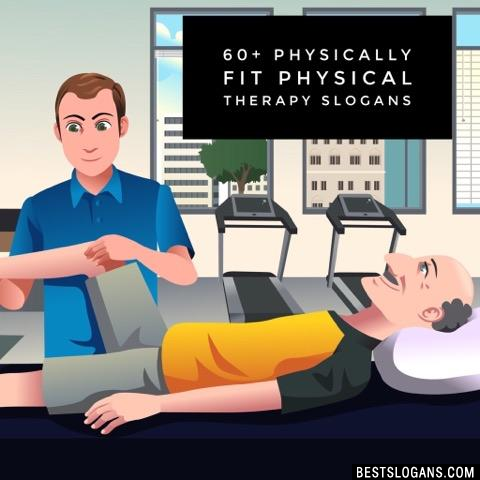 62 new entries added to physical therapy slogans, that include pictures. 1. Yes, I do hear your knee crack! 1 Yes, I do hear your knee crack! 2 You can call me "Personal Torturer" if I can call you whiny. 8 Your health. Our focus. 9 We've got your back! 11 A hands on approach. 12 Fit for life. Fit for sport. 13 Feel better and healthier naturally. 14 We are hands on! 15 Treatment that's more than skin deep. 16 If you're in pain, we are at hand. 17 Getting you better faster. 18 For all that moves you. 20 We'll get you back in the game. Can you think of a good Physical Therapy Slogans we're missing? Or come up with a clever one of your own. Please share below.